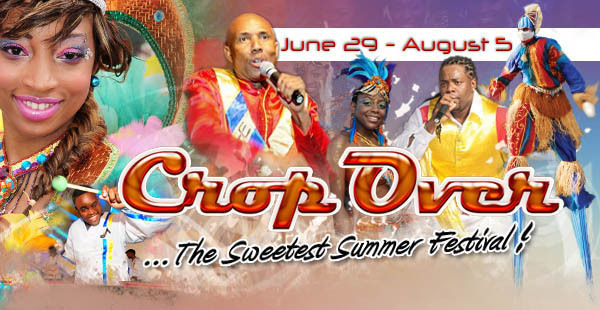 If you've been following along this blog for some time, you would be aware that around this time every year, Barbados celebrates Crop Over, our prime festival for the year. I would typically post some features on Crop Over during the festival, but this year I want to tell you a lot more about Barbados' biggest festival! Enter Festival Fridays, a new section of posts I will hopefully be doing every Friday about the major Crop Over Events coming up that week/weekend and some information on Crop Over. Already for this Crop over Season we have had a number of Calvacades (2, and 3) in May, as a warm up for the festival. This was then followed by a Heritage Walk and a Heritage Tour through Bridgetown earlier this month. Junior Monarch calypso tents as well as the Pic o de Crop Calypso tents are slated to open and be judged this upcoming week. The Junior Monarch tent had already opened earlier this week, and judging is to take place very soon for the big Calypso titles up for grabs. I'll explain those later as this post is bordering being long-winded. I hope you enjoy this new series, it's not about make up, but our Crop Over festival is a beautiful event that should be shared with you! Aspiration Diaries #13 & Happy Father's Day!